Can carbon fiber completely replace fiberglass? Is carbon fiber the boatbuilding material of the future or a flash in the pan? We talk with a few manufacturers to find out. One of the many perks of a sea trial is those other activities a builder will roll into a boat tester’s day aboard. Some years back, that’s how I found myself 40 miles off North Carolina’s Ocracoke Inlet, eating sashimi—with wasabi made from scratch in the boat’s galley, of course—from a yellowfin tuna I landed earlier that morning. 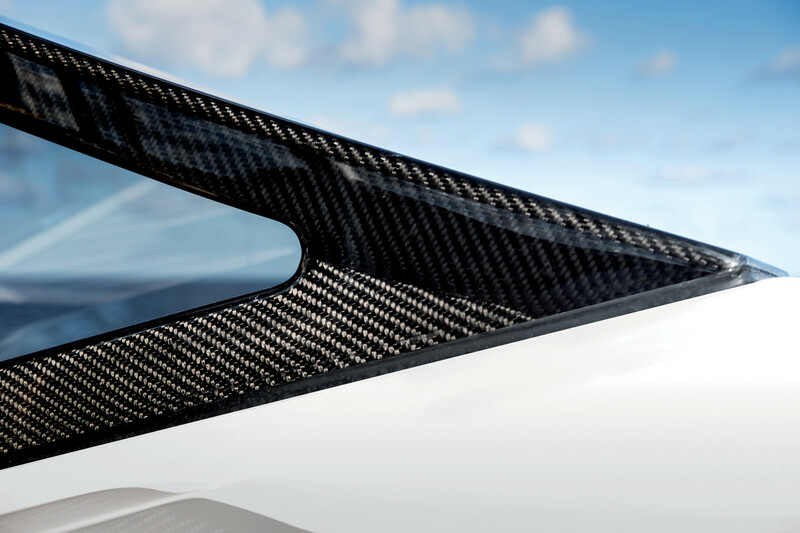 From radar masts to helm dashes, carbon fiber is being used for weight savings but also to achieve a sharp, modern look. Then something happened that was on par with the enjoyment of that just-harvested pelagic. Cruising back into port at a comfortable 30 knots, the captain spotted something high in the sky above us. Our crew watched in awe as an F-22 Raptor positioned itself under the big, fat belly of a KC-135 refueling plane, connected to the flying boom and drank deeply. After the fighter jet got its fill, it disconnected and banked sharply away and out of sight. I couldn’t take my eyes off the F-22—like the ahi and wasabi, it was a clean, immediate bullseye to the brainpan, then it was gone. The way the sun’s rays played off her skin panels, she was like a dark star. Someone commented that carbon fiber was used extensively on the F-22, most visibly on its honeycomb skin panels. We joked about building a carbon fiber battlewagon, marveled about how amazing she’d look and laughed at the ridiculous cost. At the time, it was too exotic and expensive a material for a couple of boat guys to even comprehend. Since then, carbon fiber seems to be everywhere, from the club shafts in my dad’s golf bag to the frames on the super-fast bikes of my cycling partners. The blades on the thousands of wind turbines popping up all over the country are also carbon fiber. It would appear that the cost of the material is coming down—which it is, slightly—but at the same time, Fortune 500 aerospace, energy and automobile manufacturers have exponentially increased the use of carbon fiber, seeing the value in a lightweight but solid material, driving product demand. Azimut has been incorporating more and more carbon fiber into its builds. Below, in gray, is where they’ve been using it predominantly. Boatbuilders receive carbon fiber in the same way they’d get fiberglass, in rolls measured by the yard; the strands of glass are just replaced with carbon fiber. 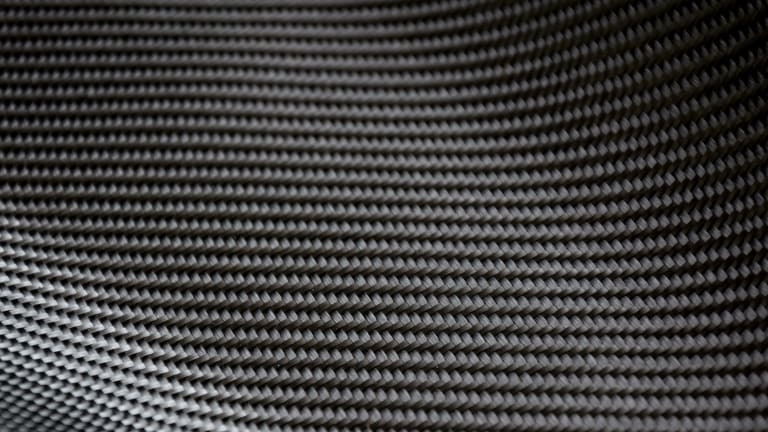 On a molecular level, in its crystalline state, carbon fiber looks like a honeycomb aligned into rows. What we see in the final product is the unique, geometric patterns that run diagonally across the sheets. The material has a lot going for it. Carbon fiber is lighter, stronger and stiffer than fiberglass, and builders have found working with it to be “exactly the same as fiberglass,” according to Glaser. Charlie Schiffer, vice president of SeaHunter in New Jersey, has also worked with the material. 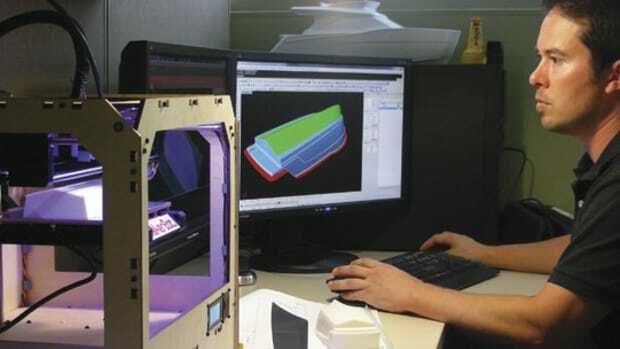 “Carbon fiber is very similar to glass but does require a higher-grade resin and some expertise in the lamination process, especially when used with other composite materials,” he said. 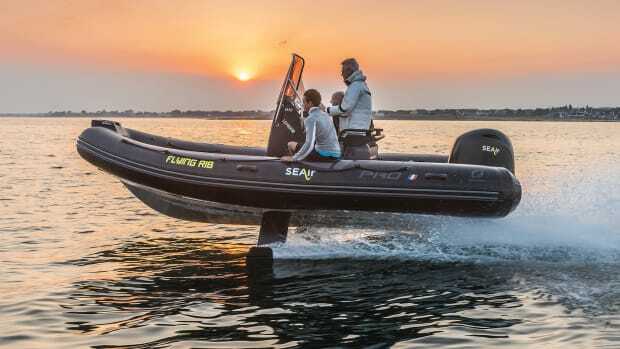 SeaHunter has been using carbon fiber since 2001 and had the advantage of a connection within the commercial aircraft trade; the builder applied what it learned to its line of center-console fishing machines that range in size from 28 to 45 feet. Both SeaHunter and Midnight Express offer custom, all-carbon builds but mainly, they use carbon fiber in places where they’re looking to cut some weight. 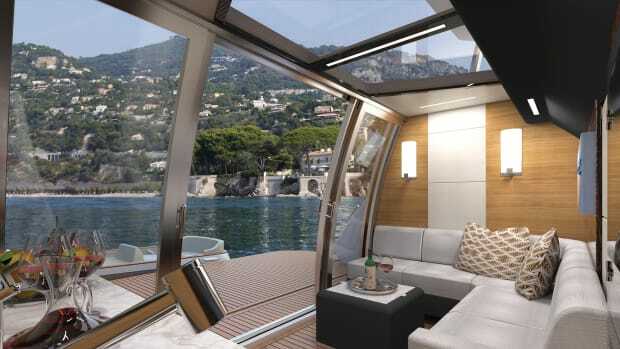 Hardtops, dive doors, hatches, electronic boxes and, in some cases, decks, helm seats, consoles and dash panels can all be made from carbon fiber. 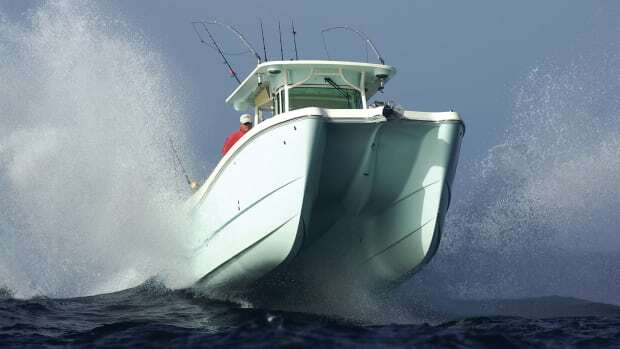 “Lighter gives you better overall efficiency, and the rigidity helps with flexing or warping, a major problem over time with fiberglass hatches,” Schiffer said. 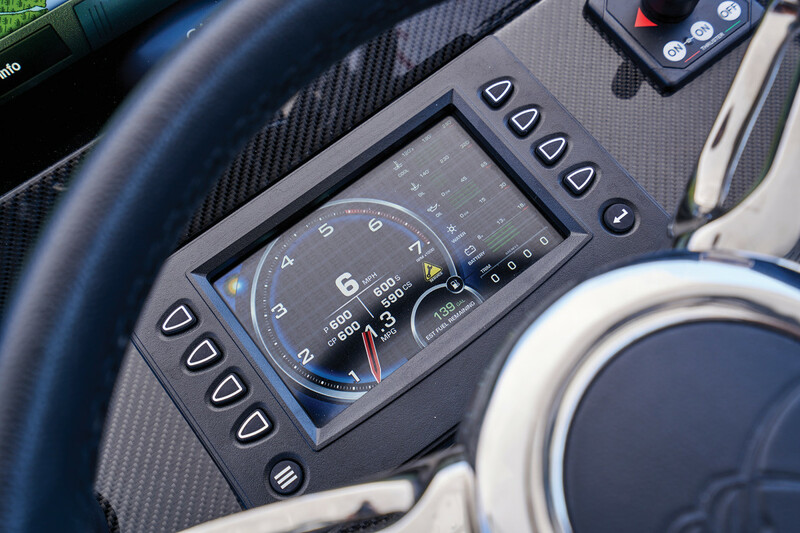 For Midnight Express’ center consoles—often seen with four or even five 627-hp Seven Marine outboards on a transom—the weight savings translate to better fuel economy and, of course, speed. 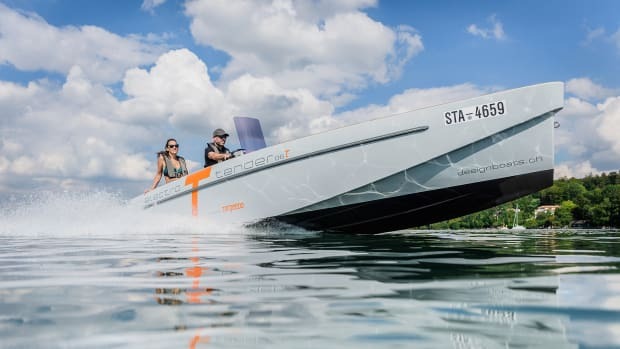 “Clients wanted to go faster [and] then there’s the cool ‘I have a carbon fiber boat’ factor,” Glaser said. 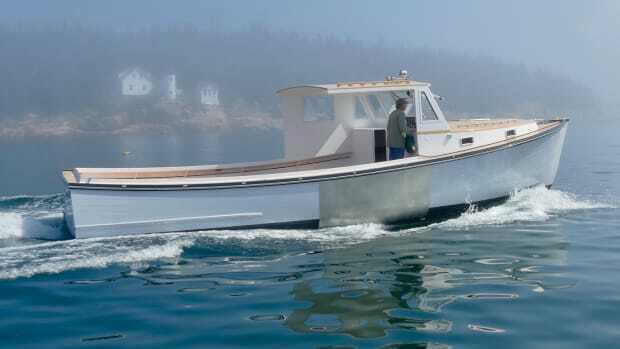 The industry seems to be leaning toward the model of incorporating carbon into traditional fiberglass builds, but there are outliers, including Delta, with its line of Scandinavian-designed, all-carbon vessels from 54 to 88 feet. 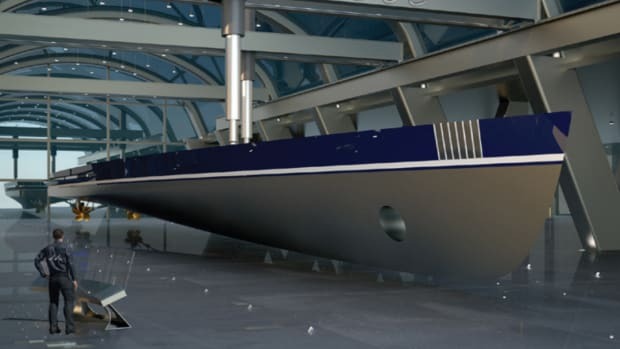 And a few years back, American boatbuilder Palmer Johnson launched Khalilah, an all-carbon, 160-foot megayacht. With her aggressive styling and deep gold hull and superstructure, she’s as recognizable as the movie stars that frequent her homeport of Monaco. 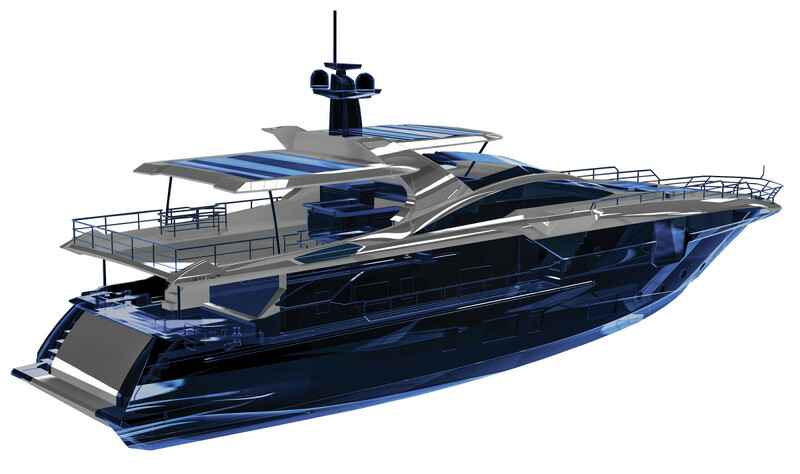 While manufacturers continue to introduce carbon fiber in small but smart ways across model lines, Azimut is taking the lead as a true innovator with the lightweight material. 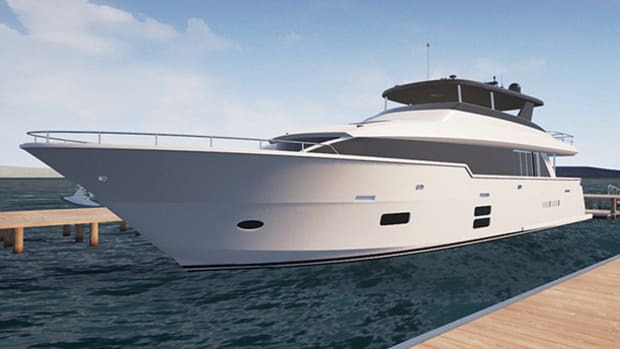 The builder currently has 10 vessels ranging from 66 to 114 feet with extensive carbon fiber in superstructures, flybridges, deckhouses, hardtops, radar arches and transoms. Carbon fiber reinforcements are also added to lower hulls. I predict that costs will eventually come down. But at press time carbon fiber is still a very pricey material, about five times the cost of fiberglass. There are other drawbacks as well, most notably rigidity. 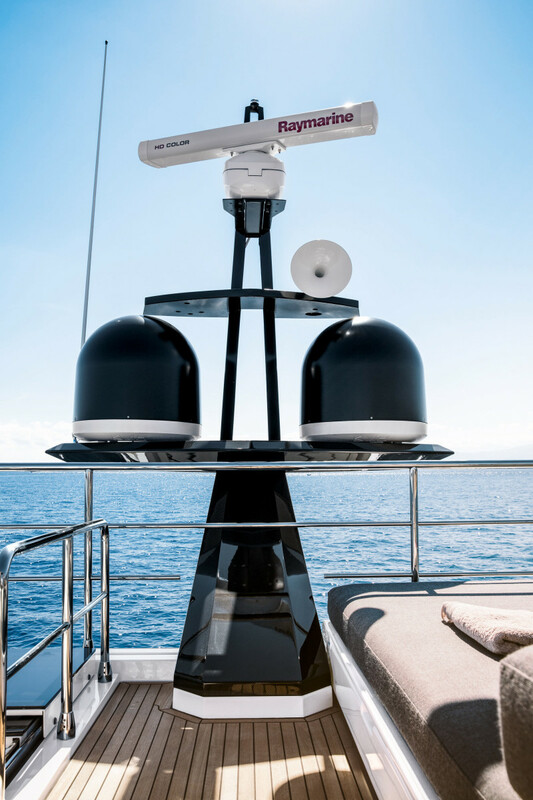 Some builders feel that the ride is stiffer and thus more uncomfortable, and Schiffer added another factor regarding its inflexibility—catastrophic damage caused by a collision that would result in significantly less damage to a fiberglass hull. “If impact occurs there is not enough give in the material to absorb shock, and the damage [to the hull] would be much greater as well as costlier.” And, as with many boatbuilding materials, carbon fiber dust can be dangerous when inhaled so great care must be taken when working with it. 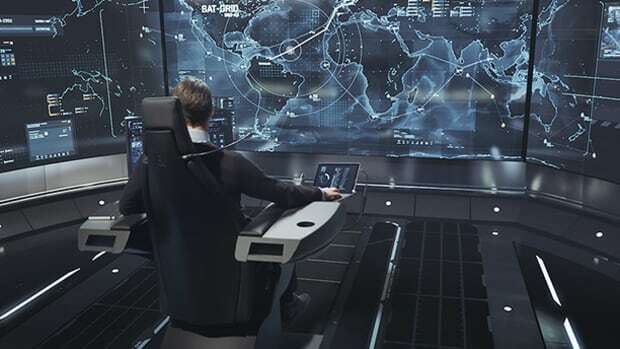 Marine manufacturers gain from breakthroughs in other industries, and will continue to do so. They are the fortunate beneficiaries of on-road advances. Can they expect the same trickle-down—and more competitive pricing—in respect to carbon fiber? If recent trends continue it’s entirely possible that someday we’ll look back on fiberglass as a footnote in the history of boatbuilding.